This vintage real photo postcard features a falconer, in native garb, and his falcon. The art of falconry may date back to the time of Mesopotamia (2000 BC). Falconry involves hunting wild animals using a trained bird of prey. Commonly used birds of prey are Red-tailed and Harris hawks, as well as Peregrine falcons. This postcard was published by Jomone which was a large colonial era photographic studio. The photographer of this image worked for OFALAC (communication office and press agency of the General Government of Algeria). The office was established at the time of the centenary of Algeria in 1930. This postcard is part of a series entitled “Scenes Et Types (no, 54)”. The photograph was taken in “Alger” which is a former colonial French province that existed between 1848 and 1962. This cabinet card is a terrific image of a Native American dressed in his tribal clothing. He has a bird on his head that looks as weathered as he does. The bird may be a turkey vulture. Hopefully, a visitor to this site with some ornithology knowledge, can better identify or confirm the bird’s species. What an amazing photograph? However, is it a counterfeit cabinet card? I located the cabinet card in an antique store and purchased it with a great deal of reluctance. Native American cabinet cards have a history of being a popular type of cabinet card to counterfeit, due to their potential high value and strong demand. There are a number of methods to make fake images. This photograph does not seem to be a product of a high tech copy machine. 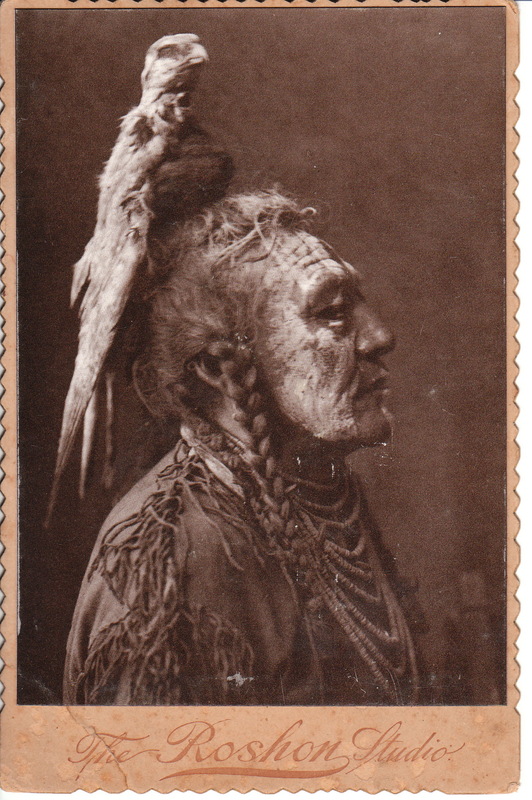 However, the image could be a Native American postcard pasted over an “ordinary” cabinet card image. This cabinet card, if not the image, is from the studio of C. S. Roshon of Lebanon, Pennsylvania. The photograph was produced in 1892. Perhaps a traveling western show was in the area of Lebanon; or perhaps Roshon purchased this image to sell at his galleries. The Roshon Galleries were located at 142 North 8th Street, and 22 South 9th street, in Lebanon. Roshon also had a studio somewhere in New Jersey. Any comments from Cabinet Card Gallery visitors, regarding the authenticity of this cabinet card, would be greatly appreciated. To view other photographs from Roshon’s studio, click on the category “Photographer: Roshon”. 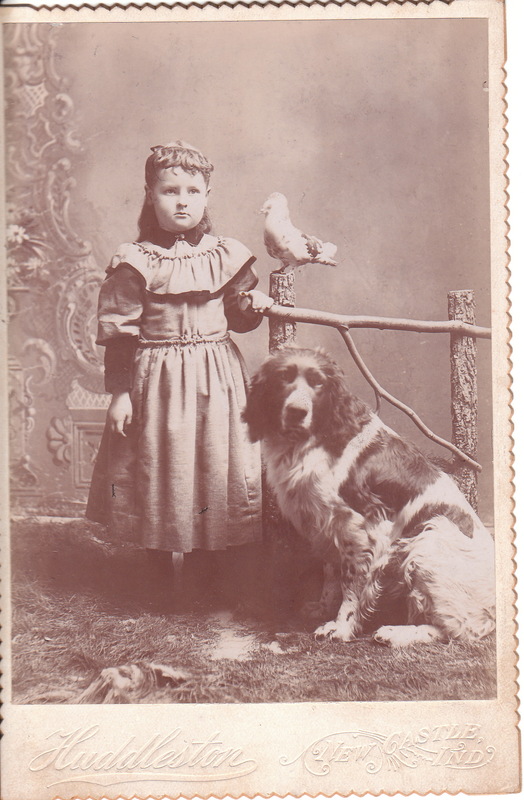 ir A young girl and her dog are accompanied by a bird in this cabinet card portrait by Huddleston of New Castle, Indiana. The dog appears to be a combination of a spaniel and a retriever and the bird looks like a fancy pigeon. Hopefully, a visitor to this site, may be more informed about ornithology, and can correctly identify the species of the bird in this photograph. The photographer is likely Cephas M. Huddleston (1832- ?) who was born in Indiana. The 1860 census lists him as a farmer living in Union, Indiana. By the 1870 census, he is listed as a photographer. Cephas had seven children. The 1900 census indicates that Huddleston was still a photographer and that is studio was in New Castle, Indiana.